The word “gene” was defined in 1909 by Danish botanist Wilhelm Johannsen as the fundamental physical and functional unit of heredity. The word was derived pangenesis used by Darwin (1868). The word pangenesis is made from the Greek words pan and genesis (“birth”) or genos (“origin”). Classical Genetics and evolutionary biology use the term for unit of inheritance. The modern definition of gene is as gene is a region of genomic sequence, corresponding to a unit of inheritance, which is associated with regulatory regions, transcribed regions and other functional sequence regions. (a) Transcription: DNA is transcribed by enzymes known as RNA polymerases into messenger RNA (mRNA). (b) Translation: mRNA is translated by specialized cellular machinery as the ribosome into a polypeptide chain. These polypeptides chains fold upon to form functional protein molecule. Genes govern the activities of cells through the proteins they encode. In multicellular organisms, they control the development of the individual from the fertilized egg. They also control day-to-day functions of the cells that make up tissues and organs. Their protein products give mechanical support to the cell structure. These proteins are also involved in the transportation and manufacture of other molecules and the regulation of other proteins activities. 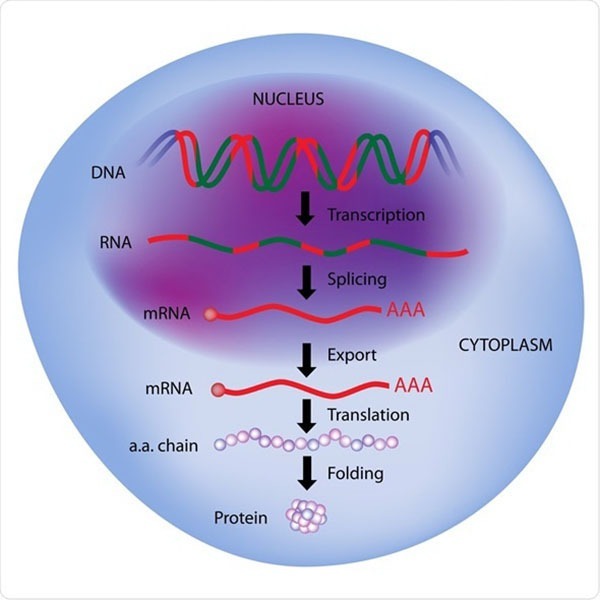 In some cases, the RNA molecules are the actual functional products of gene. For example, RNAs known as ribozymes are capable of enzymatic function, and small interfering RNAs have a regulatory role. In most eukaryotic species, very little of the DNA in the genome encodes proteins. The genes are separated by vast sequences of junk DNA, Moreover, the genes are often fragmented internally by non-coding sequences called introns. Introns can be many times longer than the coding sequence. Introns are removed after transcription by splicing. 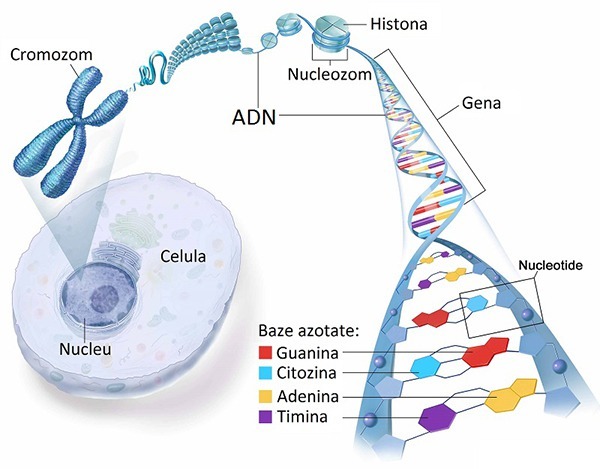 The coding regions of the gene are called exons. (a) The DNA strand is expressed into a trait only if it is transcribed to RNA. Transcription starts from a specific base-pair sequence (a promoter) and stops at another (a terminator). (b) Cells regulate the activity of genes in part by increasing or decreasing their rate of transcription. 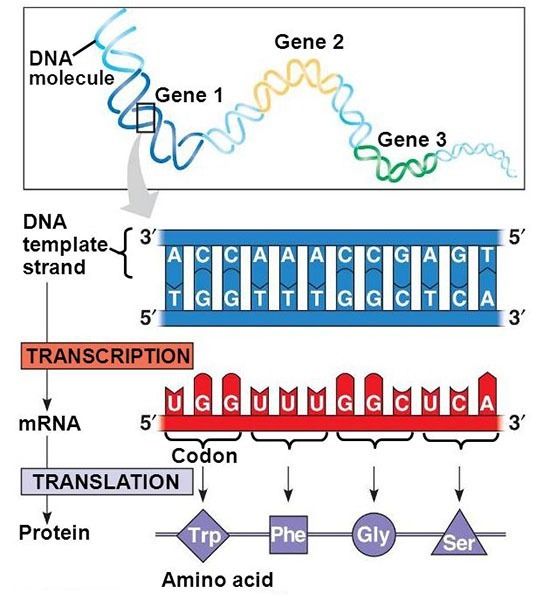 Over the short term, this regulation occurs through the binding or unbinding of proteins, known as transcript ion factors, to specific non-coding DNA sequences called regulatory elements. (c) The RNA is edited before its translation into a protein. Eukaryotic cells splice the transcripts of a gene. It keeps the exons but it removes the introns. (d) The translation of RNA into a protein also starts with a specific start and stop sequence. (e) Once produced, the protein the interacts with the many other proteins in the cell, according to the cell metabolism. This interaction finally produces the trait. This complex process helps explain the different meanings of “gene”. Or the transcribed RNA after splicing, i.e., without the introns.